Let�s consider one more easy way for automated playout of markers with tie-in of their displaying to events in the main playlist. For the solution of this task it is not necessary to use lists of secondary events and auto-generation. You can configure the server platform in such a way that it will be enough to set a name of a graphic clip that displays the age category in the appropriate playlist column. Let�s look at a certain example: the server database contains clips of graphic design with numbers 12+ and 18+, the names of these clips are age12, age18 etc. The clips have infinite duration, playback of an appropriate clip-marker should start synchronously with the start of the main on-air event, and duration of displaying the clip is eight seconds. The markers should be played back in the second graphics playlist (LAY_2). Implement adjustment of the server. Configure the rule (Action) that will trigger by the following condition: if you enter a name of a clip-marker (see the picture) into a certain column of the main playlist (for example, into the column GPI_V2), the clip will be automatically placed into the playlist of the graphic layer #2 and played back synchronously to the start of the main event. � Find the field Name in the window Action Configuration and specify a random name for the rule: for example, AGE. � In the field Layer choose �1� (the number of a program channel #1); in the field Address specify the server IP address, or leave the field empty, if the value is �localhost�. � You can set the time shift for the start of a graphic event in the field Delay. � Choose the service name by the button ... in the field Service. In our example, it is the playout channel #1 (ProgramChannel_1 on the list). � In the field Action press the button � and choose a command Play Clip that will be executed in case of triggering the rule. 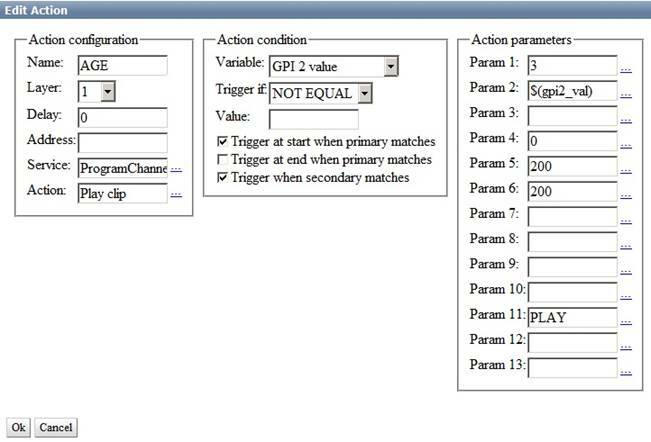 � Configure the rule in the field Action Condition: find the field Variable and specify a column of the main playlist, which will be responsible for executing the rule - for example, Gpi 2 value (GPI V2 in the playlist). Set the trigger as NOT EQUAL, leave the field Value empty. It means that the rule will trigger every time when the playlist column GPI V2 is not empty. � The item Trigger at start when primary matches is responsible for triggering the rule synchronously to the start of the main event. � You can configure parameters of the rule in the right window Action Parameters: find the field Param1 and choose the number of the layer that will contain a graphic clip. The first layer is the main full screen layer, the second one is the first graphic layer, therefore, choose the number �3� for the second graphic layer. � In the field Param4 set the initial point of a graphic clip for the playout start, in the field Param5 set the final point, in frames. In the field Param6 specify duration of the clip in frames. � Find the field Param11 and enter a command that will be executed for the clip in case of triggering the rule - PLAY. Press Apply Changes (at the top part of the server control console), to save settings. Herewith, the playout channel with changed configurations will be reloaded; playback of the current channel will be stopped while reloading.